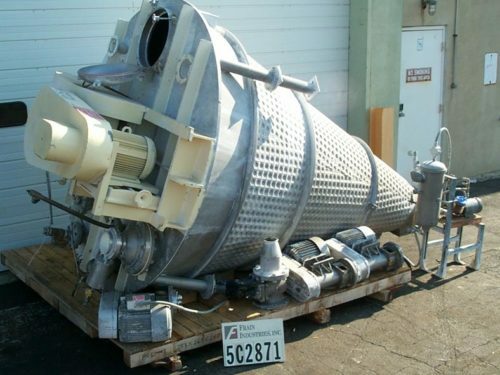 Ross, 20 ft³ workable, double ribbon mixer with 304 stainless steel contact parts. Inner mixing chamber dimensions: 60" in Length; 24" in Width; 26" in Depth. Equipped with flip up cover, 24" long x 20" wide x 16" deep hopper with bottom (4) paddle sifter powered by a 1 hp drive, 2½" OD mixing shaft with 1¼" wide x (3/8)" thick (outer) and 1¼" wide x (1/8)" thick (inner) stainless steel ribbons. 4" OD center bottom manual slide discharge with 38" ground clearence. Mounted on painted base. J H Day, 36 ft³ workable, double ribbon mixer with 304 stainless steel contact parts. Inner mixing chamber dimensions: 78" in Length; 30" in Width; 32" in Depth. Equipped with flip up cover, 24" long x 20" wide x 16" deep hopper with bottom (4) paddle sifter powered by a 1 hp drive, 2½" OD mixing shaft with 1¼" wide x (3/8)" thick (outer) and 1½" wide x (1/8)" thick (inner) stainless steel ribbons powered by 10 Hp motor drive. 4" OD center bottom manual slide discharge with 34" ground clearence. Mounted on painted base. J H Day, 25 ft³, double ribbon mixer with pounds of product per hour – depending on materials and application. 304 stainless steel contact parts and Inner mixing chamber dimensions of: 67" in Length; 26" in Width; 28" in Depth. Equipped with flip up cover and flip up safety grate, 3" OD mixing shaft with 1¼" wide x (3/8)" thick (outer) and 1½" wide x (1/8)" thick (inner) stainless steel ribbons. 3½" OD center bottom discharge with manual slide gate and 36" ground clearence. Mounted on (4) leg frame. Double sigma mixer. 35 Gallon working capacity (65gl Total capacity). Tangential blade mixer, tilt discharge. Carbon steel contact parts. Vessel dimensions: 28" in Length; 24" in Width; 24" in Depth. (OAD: 65"(L) x 24"(W) x 52"(H). J H Day Model NAUTA MBX1225, 122.5 cu ft, 304 stainless steel, 3 zone, dimple jacketed Nauta mixer. with pounds of product per hour – depending on materials and application. Cone shaped vessel: 90" top OD and 10" bottom OD and 136" straight wall. Equipped with 24" OD bolt down manway, with (1) 5" OD and (1) 7" OD sight ports, (2) top mounted separte drive motors. 3 Hp drive for the arm, 20 Hp drive for the 14" OD main mixing auger screw with standard universal joint and has three intermixing actions: turning on its axis, orbiting the tank and spiralling the material upward. Dimple jacket rated to 125 psi at 350 deg F, with vacuum. Mixing viscous product, with viscosities from 100,000 – 300,000 centipoise and densities from 1.3 – 3.6 grams per cc. (3) 3 Hp self-powered "Lumpbreakers" mounted near the bottom of cone that draw product from tank across impellor and back into mixing screw with Sihi vacuum system. Nauta, cone shaped mixer designed use on powders or paste applications. Dry materials are charged (loaded) thru top opening 10" ports. Mixer is rated up to 78 cu ft working capacity or 586 gallons. Mixer utilizes auger that rotates the circumference of the vessel. The screw auger’s spiral action is upward, lifting ingredients from the bottom of the cone up through and intermingles the product together. At the same time, the orbital action moves the material away from tank wall towards the center. The materail moved upward gravitates downward for a complete mix. Process generates limited heat build up and is one of the quickest mixing methods. Auger is supported at bottom by a "captive ball support". A mixer of this capacity is generally diven by a 7.5HP on screw auger and 1 hp on arm drive. Motor is not included. Vessel is mild steel and was last used in chemical application. OAD: 140"h x 80"dia. 50 Gallon, dual motion, planetary, vertical pony mixer. Equipped with a 28" Diameter x 20" Deep stainless steel mixing bowl, four 23" long x 2" wide stainless steel agitation blades, one 23" long x 2" wide stainless steel stationary baffle, and a hand crank adjustable height mixing head. Double arm stainless steel, jacketed, overlapping sigma blade mixer, 75 gallons total and 45 gallons working capacity. Mixing chamber dimensions: 26" long x 30" wide x 26" deep. Equipped with flip-up safety grate, stainless steel contact parts, full jacket rated 80 psi @ 324 F, 15 hp main and 1 hp tilt motors with chain drives. Push button controls, E-stops and electrical safety interlocks. 50 gal, Twin motion vertical Pony Mixer Has A Maximum Working Capacity Of 50 Gallons. Equipped With 304 S/S Bowl That Measures (28" Diameter x 20" Deep). Main Frame And Head Are Cast Iron Construction, With A Adjustable Head Raising Mechanism. (2) Counterrotating Overlapping Agitator Spindles. Unit Is Recommended For Liquid And Fluid Applications Such As Paints, Ink, And Pharmacutical Ointments. Heavy duty 3-roller dispersion mill rated at 700 lbs per hour depending upon application equipped with 34"W x 9" diameter hardened rollers and a 34" working area with a 40" discharge height. Three roll dispersion mill rated up to 350 lbs per hour – depending on materials and application. Roller size: 10" in diameter; 22" in length. Roll speed: apron roll 300 rpm; middle roll 150 rpm; feed roll 59 rpm. Equipped with apron, stainless steel end plate, hydraulic roll sets, doctor blade, and stainless steel mesh guarding.